A versatile addition to the culinary space of your home is this Qualis Sideboard. The shelves behind the four framed-front doors provide ample space for your bowls, utensils, and jars. Store flatware, smaller bowls, cutlery, napkins and placemats in the three top drawers. The top of this home furniture offers an extra serving space during a large, family gatherings. In a bold black finish, this country-style furniture has traditional lines that preserve its vintage look and feel. Excellent addition to our dining room set. Great quality for price. Looks beautiful. 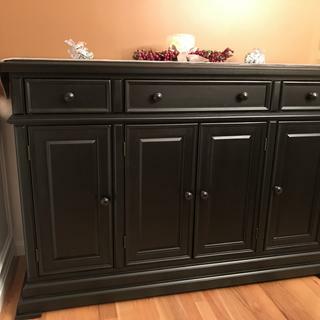 Downsized to a Condo recently and this piece has so much storage without taking up a huge amount of space. We have very little wall space in our informal dining area so we couldn't use a full hutch. This piece provides all the storage we need. Plenty of drawers and shelves. Hi there I want to purchase this. can you recommend a matching one at 52” length? The Winners Quail's Run does offer a different version. Below is the link. This item is not something we currently carry and would have to be special ordered. Please contact any of our locations and provide the link above, a member of our sales team will be happy to assist you. Are the shelfs adjustabke or permanent please ? And if shelves are not adjustable a. What is the height of each shelf inside? I need i to know max height for each shelf so I can knight w How tall the items I can fit on each shelf. Thank you. 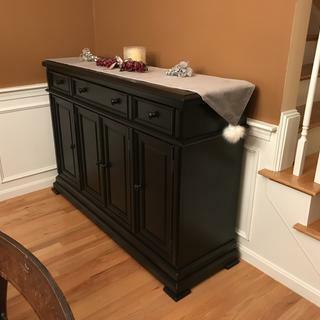 The Winners Only side board has adjustable shelves. The shelves can be adjusted to 10 inches to 14 inches.